Patented QuadTruss® design makes Eagle shelves up to 25% stronger and provides a retaining ledge for increased storage stability and product retention. 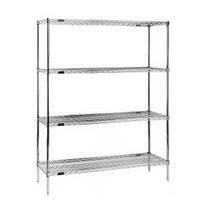 MICROGARD® standard on all EAGLEgard® shelving. MICROGARD® is an antimicrobial agent which contains built in protection to retard the growth of a broad range of bacteria, mold and mildew on the surface of the shelves that cause stains, odors and degradation.